Grenache (in Spanish, Garnacha, in Catalan, Garnatxa) is one of the most widely planted red wine grape varieties in the world. It ripens late, so needs hot, dry conditions such as those found in Spain, the south of France, and California’s San Joaquin Valley. It is generally spicy, berry-flavored and soft on the palate with a relatively high alcohol content, but it needs careful control of yields for best results. 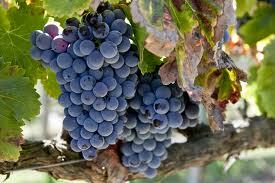 It tends to lack acid, tannin and color, and is usually blended with other varieties such as Syrah, Carignan and Cinsaut. Grenache is the dominant variety in most Southern Rhône wines, especially in Châteauneuf-du-Pape where it is typically over 80% of the blend. In Australia it is typically blended in “GSM” blends with Syrah and Mourvèdre. Grenache is also used to make rosé wines in France and Spain, notably those of the Tavel district in the Côtes du Rhône. And the high sugar levels of Grenache have led to extensive use in fortified wines, including the red vins doux naturels of Roussillon such as Banyuls, and as the basis of most Australian fortified wine.